Service events are often chaotic and stressful. When an asset breaks down or connected asset (IIoT) sensor data alerts you to potential problems, does this kick off a series of phone calls, emails and unproductive time trying to figure out what to do next, scheduling it and then trying to track and manage the process? When that happens, manufacturers, dealers, service providers, leasing companies and fleets all feel the pain and the costs. Fleets, OEMs and service providers are increasingly relying on advanced technologies to make truck maintenance more efficient and cost effective. The 7th annual Decisiv Maintenance Summit and User Conference took place recently in Reston, Virginia. During the five-day summit, fleets, providers, lessors and managed maintenance providers tackled the most important issues in trucking and transportation. This year, the focus was on outsourced fleet maintenance services and the need for transparency in obtaining real-time status updates and KPIs. The key to success in fleet maintenance is keeping communication flowing through the entire service and repair supply chain. When fleets, manufacturers and service providers all use cloud technology and a closed-loop Service Relationship Management (SRM) system, all parties have access to real-time information about asset and repair status. That greater transparency, as well as faster approvals, remove major sources of friction and conflict within the supply chain. Today’s vehicle fleets have vast amounts of data at their disposal. 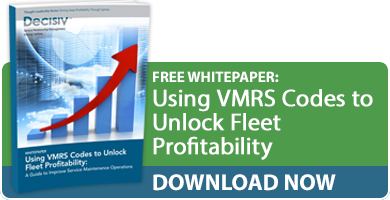 Is Lack of Asset Visibility Hurting Your Truck Leasing Profits? When your revenue depends on a healthy truck leasing operation, you face three key challenges. I don’t normally use this forum to promote Decisiv or our solutions; instead, I try to focus on timely and important industry topics. However, there’s been a major milestone for us and the industry. This past week, it was announced that that Peterbiltand Kenworth will be using the Decisiv SRM platform to power their service management initiatives. As a truck or equipment manufacturer, you spend millions, if not billions, of dollars designing and building products that effectively meet customer needs and, hopefully, provide a level of differentiation at the point of sale. With the average age of drivers rising and the driver shortage getting worse, you need to double down on your driver retention efforts. Does this mean that you need to increase wages? What Are Your Fleet Maintenance KPIs?